• Control with microprocessor which manages the operation of the machine and offers a constant dew point with PID control of the regeneration. • Filtration through a “panel“ filter, easily accessible and cleanable. 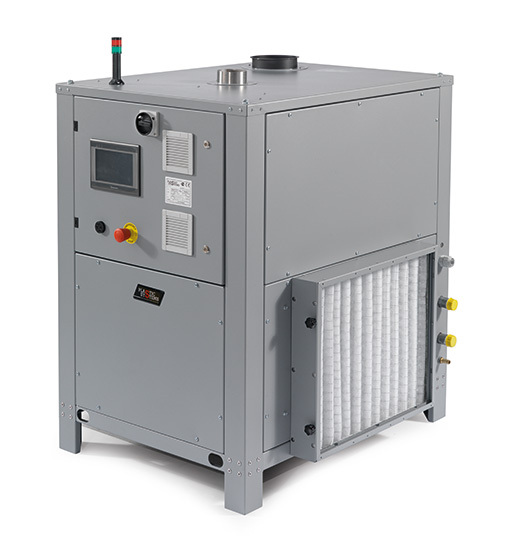 • The precooler of the air with heat exchanger that uses low-temperature water 7-10°C. The condensed water is discharged from a pump with built-in float. • The high-efficiency fan sends air to the high-efficiency absorbent rotor which ensures a stable process even in tropical climatic conditions with temperatures up to 45°C and moisture up to 90%. • To reduce the temperature of the air on the outlet pipe, you can install an aftercooler. • R S485 Modbus interface. By reducing the cycle time. Rejects due to the moisture present on the mold. Eliminates the risk of corrosion of the mold and its maintenance.